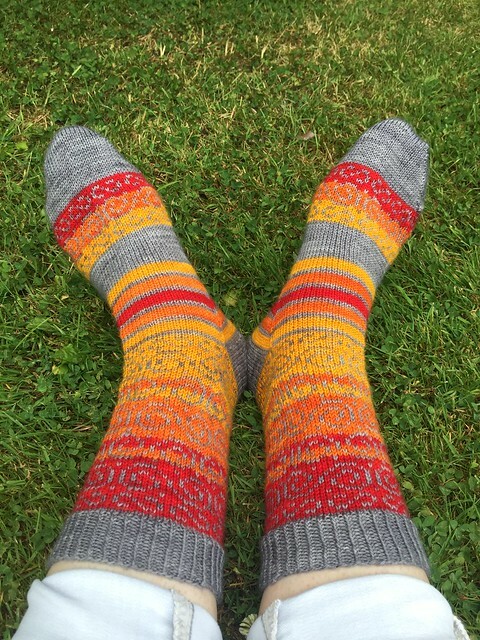 Do you remember a few months ago I had no socks on the needles, so started playing with mini-gradient sets based on leftovers in my sock stash instead? 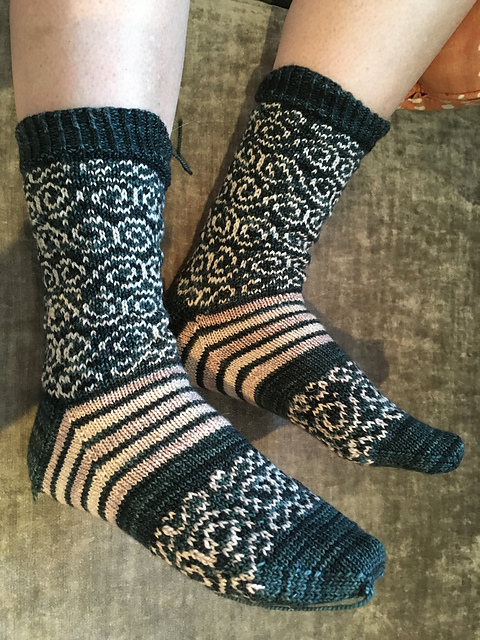 These socks are the end result! ETA: pattern is now live on Ravelry! 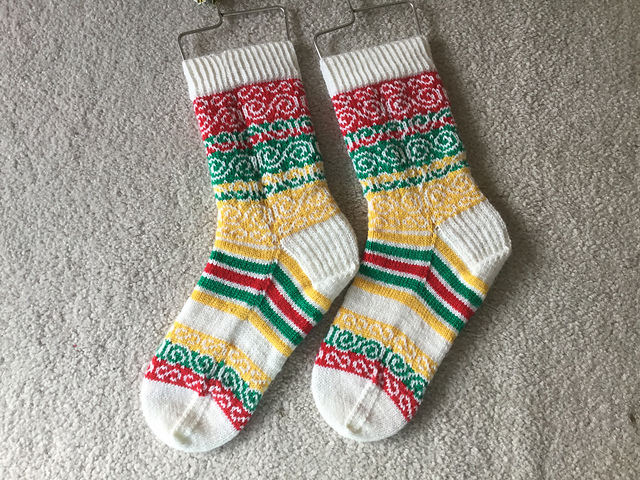 I had ambitions to create some lacy or patterned (not colourwork) striped socks using a gradient set, and that’s where I started with these, but when I started doodling patterns I couldn’t get spirals and swirls out of my head – and those proved to be easier to create via colourwork rather than anything else. 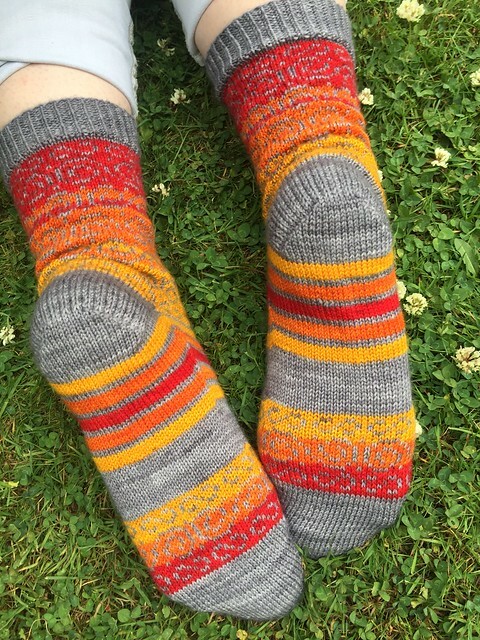 So I slimmed down the gradient to just three (red, orange and gold) and paired them with a contrast grey to run from top to toe (or toe to top). I deliberately went for stripes over the gusset to make it an easy section to knit (and, selfishly, to write the pattern for!) 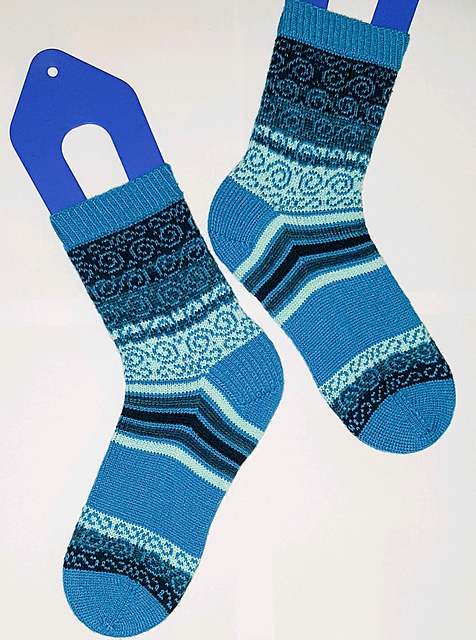 – and that plain grey section after the stripes makes these socks very easy indeed to alter according to your desired foot length. I did do a bit of knitting and re-knitting with this pattern, but not all that much – in the end these guys almost designed themselves. It was a really satisfying way to use up some existing stash yarn – I’m basically incapable of throwing any leftovers from socks away unless there’s barely a gram or two left, so working these out was very pleasing. The pattern is launching THIS FRIDAY (whoop whoop!) – watch my designs page on Ravelry to see when it pops up and, as ever, it’ll have a 20% launch discount for the first week. It’s live now, it’s live now! Check it out! 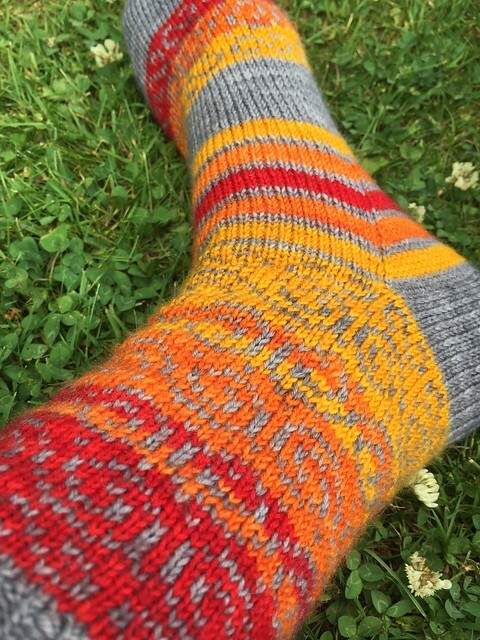 My brilliant gang of test knitters worked their versions of Swirls and Stripes in some amazing sets of colours, which create entirely different vibes – have a look at some of their lovely work. I love all of them and especially like how the last pair shows how playing with the colour positioning and changing multi-colour into simpler shades can totally alter the whole feel of a knit. 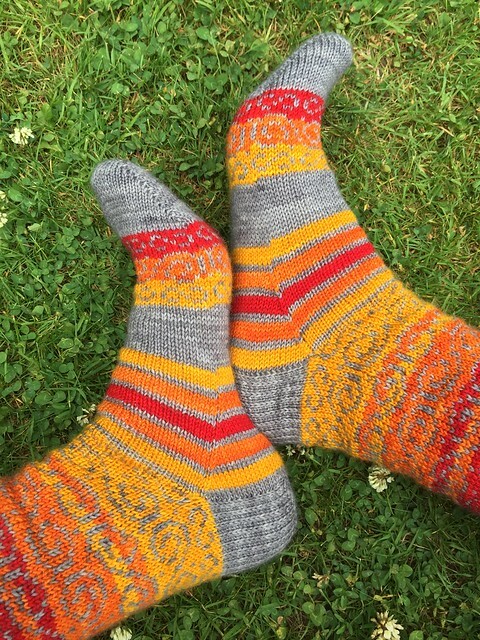 Pattern: Swirls and Stripes socks, by me, now live! Fun, fall colors in that first pair. What neat results your test knitters got for your pattern. They came up with some beauties, didn’t they? I love how changing the colours completely changes the feel. Love these! My mind is already swirling with possible combos from stash! They are beautiful! I love the swirls! Oh wow! I’m just catching up on some blogs and I have to say these are beauties! I also adore the other color combos and could totally see myself making a pair of these. I’m off to see the pattern on Ravelry! It’s awesome isn’t it? Amazing what a difference in colour can do!